These are video recordings of Favianna Rodriguez’s thought-provoking artist talk in the UCSB Library held on January 30, 2013 in conjunction with the Library exhibit, “Favianna Rodriguez: Art of the Activist Imagination” (Spring 2013). 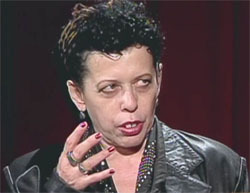 Rodriguez is an artist, activist, and teacher based in Oakland, California. Her bold posters and digital art deal with social issues, such as immigration, globalization, economic injustice, patriarchy, racism, and war. The video documentary Leo Limon: Portrait of an Artist was created to address this paucity. 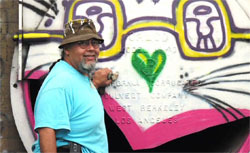 It is about one of the most popular and visible artists in the Chicano art movement. The video captures various phases of the artist’s life in the context of the broader history of important cultural centers such as Self-Help Graphics & Art and the Mechicano Art Center, and his proactive and collaborative approaches to alleviate gang violence and other social problems confronting at-risk urban youth and residents in high-violence neighborhoods. In addition, the video explores his important work in the preservation and restoration of the Los Angeles River as an ecological and recreational zone for the Los Angeles community. It illustrates the cultural and economic benefits of innovative parklands preservation through initiatives like the L.A. River arts program. 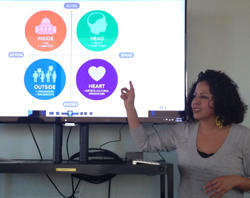 Diane Gamboa was a visiting artist at UCSB near the end of May. On May 25, 2011 this video was recorded during her visit. 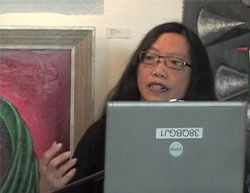 Video of the Come Together Panel Discussion (streaming quicktime) with artist Nancy Hom and Juan Fuentes moderated by Professor George Lipsitz - February 8th, 2011 at the UCSB MultiCultural Center. This Shades of San Diego Show was produced by Diana Guevara and aired April 18, 2010. It includes an interview with artist activist Alurista, muralist Mario Torero and and Irene Mena, honorary mother of the Brown Berets. 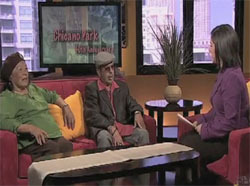 This show celebrates the 40th anniversay of Chicano Park. It is used with permission from Diana Guevara on behalf of Channel 4 San Diego, Cox Meida.